There is a blog exposingkultchara.wordpress.com which deals with the cyber methods of Tsem Tulku and his followers. The blog is run anonymously. It has recently posted a post “Kultchara’s public meltdown”. 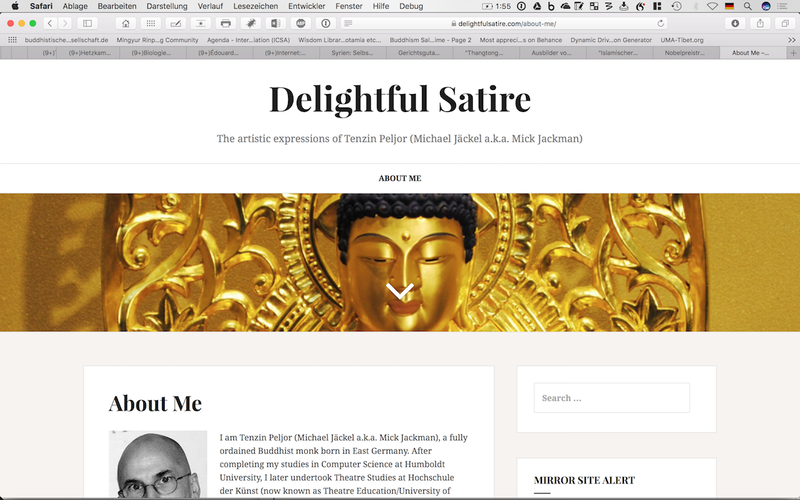 Tsem Tulku followers mirror that blog under “exposingkultcharaA.wordpress.com” and claim that this site is run “by Tenzin Peljor (Michael Jäckel aka Mick Jackman), Carol McQuire and Jiunn Hsiao (Lobsang Nyima aka Yogini Souldiva)”. Carol McQuire or I have nothing to do whatsoever with any of these blogs or sites. On Twitter Tsem Tulku followers use similar tactics but go even further. To give an example, among others they fake existing accounts like @Snowlions (which attacks them) and create own accounts like @SnowIion (capital i instead of l). With such a fake account like @SnowIion they make known the supposed identity of the @Snowlions account holder (they erred about supposed identities different times) and post images of the family members of the person they assume is behind the @Snowlions account. So, Tsem’s followers seem to be stalking the family of the guy they believe is behind the @snowlions account. Tweeting out photos of his wife, kids and home. If you are not yet familiar with the Tsem Tulku story, save your time. Kechara / Tsem Tulku are really keen to slander, attack and denounce all those whom they perceive as their enemies (including the Dalai Lama, former members, or former “pastors” of their group) while they portray themselves as terrible suffering victims. From Buddhists I’ve never encountered such an amount of confusion, lies, self-pity, aggression and spite as it is spread by Kechara / Tsem Tulku and his followers online. Since this crazyness is self-revealing, I think, there is no need to analyse it or to give more comments on it. It is however true, that Tsem Tulku and his followers are also attacked and slandered. As far as I can see these attacks come often from disillusioned members who grew up in his organisation Kechara and didn’t learn it better – being influenced by the bad examples set up by Tsem Tulku himself. Moreover, many of these people started it rather as a defence (maybe also revenge) or to let people know about the cyberbullying tactics of the Tsem/Kechara organisation after Tsem Tulku & his followers had bullied them already viciously online (with slander of having committed crimes, supposed sexual preferences, supposed evil minded nature, revealing their full identities online etc). It’s really ugly! 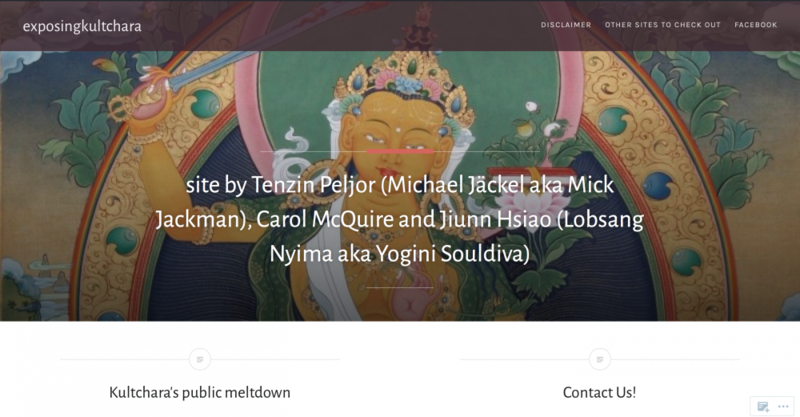 Followers of Tsem Tulku have set up another mirror site for which they abuse my name in order to pretend I run it. The name of the site is byebyeshugden.wordpress.com it mirrors the anti-Tsem blog goodbyeshugden.wordpress.com. In the about section of the fake blog they list my name, address, telephone numbers etc in order to give the false impression I run it. The same happened with letterSforkecharahouse.wordpress.com. They took the “S” out of letterSforkecharahouse.wordpress.com site, created the mirror site letterforkecharahouse.wordpress.com and put my name, address, telephone numbers etc on the about page, claiming wrongly that I run it. On Jan 3, 2017, the WordPress team suspended the byebyeshugden.wordpress.com site after I had reported it to them as a case of identify theft. I reported the other three remaining sites now too. On Jan 4, 2017, all of the remaining sites have been suspended for a breach of the WordPress.com Terms of Service. On Jan 5-6, 2017 I reported three more blogs which wrongly claimed they are operated by me. WordPress has kindly suspended these too. Another fake site is delightfulsatire.com … Who has so much time to create this? Well guys, enjoy your life and use it well. Tenzin Peljor has done so much harm to so many people. I am surprised it has taken so long for the focus to be thrown back at him and not a minute too soon. Years of attacking real monks whom he knew were bound by vows not to respond, emboldened this ‘monk’ . He now even brags that he is behind sites that have clear criminal intent. I googled his name under various aliases and came across this very damning site with his name on it boasting to be the owner. It seems, creating these sites and putting my name on them has two reasons: 1) its a means to slander my person and 2) they can continue to portray themselves as victims. After a complaint by me, upon investigation, Live Journal has permanently suspended kultchara.livejournal.com. Also a google blog, using the same tactics, has been permanently suspended by Google. Here are some screenshots. I stopped now getting all of these accounts suspended or deleted, its just too ridiculous and time consuming. These spiteful games are beneath human decency; they achieve nothing of merit. The perpetrators must be careful, these actions are unhealthy and will not lead to a calm and balanced mind. From what we know of Kechara (statements from former members), these operatives work in a dangerous and threatening environment. I hope for their sake they can find a way out and stop these attempts to cause harm. Indeed, Kieran. Tsem has been trafficking in false news and racial invective as a cottage industry for a number of years now out of Kuala Lumpur. At least we can say he is right on trend in our current ‘post-real’ Trump era. We were all wrong to think that monsters of the id like the KKK and King Dolgyal cannot be exploited again for personal profit and ego gratification again and again. Looks like you’ve got some problems and I don’t envy you. But you may be compounding your own problems. I see that you are carrying news of the mirror sites on your blog and drawing attention to them. Frankly, it’s more confusing than ever and I don’t understand your reasons. It looks like you are keen to advertise sites that defame Tsem and you are perpetuating the defamation. Perpetuation is also dangerous legally depending on country and legal counsel. This can be a legal issue. I don’t see why you would expose yourself to even more liability? As it is you are already named in the sites that may be subject to legal suits. If that is not damaging enough, you are spreading the news and accusing Tsem’s people of another misdemeanor that is to create the mirror sites. How can you legally prove Tsem’s people reproduced those sites? You accusing them is not good. Think, why would Tsem’s people spread negative news about Tsem and themselves? If you cannot prove that the contents for those sites are right, you are liable to false accusations. If you cannot prove that Tsem’s students created the mirror sites you are again liable legally. Whether you remove the sites you created on Tsem or not is up to you and your friends who manage them. All emails, registration and trails are clear. The more people read it, the more angry people can become. But your cybertrail is there. If you remove it, the cybertrail is still trackable from the removal, but they are not reading it any further and not getting angrier. Just my thoughts for you. I am a fan of your work and I am just concerned for you. Anne, there is no need to claim you are a friend of mine in any way. You aren’t. You are just here to continue the spins by the Tsem people in the guise of friendship. You continue those spins by claiming “Whether you remove the sites you created on Tsem”. I’ve never ever created any site on Tsem. Full stop. No further comment by a Tsem apologist will be approved. By the way, as cults on the TibBuddh fringes go, you should cover the Aro folks, too. I lack knowledge about the Aro folks – though I was confronted with it a bit in the past and read some stuff by a Nyingma practitioner from Austria. Maybe you could post some good links about the Aro folks or write a guest post? NB while the NKT did manage, through skilful networking with the FWBO and SGI uk, to dominate the NBO and its decision making processes, using the NBO status to further the individual status of each, this relationship with the NKT ended after the NBO exec asked the NKT not to demonstrate against HHDL. Of course, this was because the NKTs actions were damaging the squeaky clean appearance of FWBO/ SGIs NBO Trojan horse; the three groups had managed to benefit significantly from the perspective of representative reputation and grants by promoting the NBO and maintaining senior roles within it. When the NBO was at the height of its powers it counted among its members only approximately 30 groups of the UKs 700 plus groups, with only a tiny number of Asian groups represented. Despite this, the NBO managed to make its way onto several government advisory bodies, through its perceived ( though totally non existent) representative status. The conflict with the NKT helped bring about the fall of the NBO which is now a shadow of its former self, though even now, for status promoting purposes, it remains dominated by FWBO Triratna and SGI. As such, the U.K. NBO cannot, as Tenzin indicates, be trusted to provide a neutral and informed perspective on British Buddhist groups. In such a corrupt moral vacuum, the actions of Tenzin are indispensable. I don’t understand their motivation, these are not the actions of a Buddhist. The motivation of the dolgyal cult website run by Tsem and his host of fictional editorialists like “Kay Beswick” is clear: to discredit the Central Tibetan Administration from every conceivable approach. One would think that ds.com–concerned as they are about human rights– to be fair would critique the PRC for running slave labour camps or Laogai 勞改/劳改, estimated to have caused 15-20 million deaths and whose “inmates were subjected to back-breaking labor in the most hostile wastelands, and that executions and suicides by any means (like diving into a wheat chopper) were commonplace,” (Chang, Jung and Halliday, Jon. Mao: The Unknown Story. Jonathan Cape, London, 2005. p. 338) Then there are the current cases of ‘disappearing’ Hong Kong booksellers after Occupy Central. China and North Korea have a Stalinist approach to media, its all about state control and disinformation. I feel Tenpel probably understands this having lived under it. Tsem has grown rich propagating the PRC project of deconstructing Tibetan Buddhism. The policy of controlling Tibetan lamas’ reincarnation by the Communist Party of China shows the extent they are determined to destroy their enemies once and for all. UPDATE: After I reported those four sites to WordPress, they all have been suspended for a breach of the WordPress.com Terms of Service. FYI. This blog is been manipulated now for some days. The manipulations have started on 31st December 16 and continue. The WP statistics indicate that there is an unusual high traffic from Malaysia. This traffic – which is up to 6 times as much as usually – distorts the “Most Read Posts & Pages” and “Most clicked”-external link statistics. I suspended now both statistics from the landing page. The manipulations pushed less relevant posts and removed relevant posts from the “Most Read Posts & Pages” list and it pushed irrelevant blogs (e.g. blogs defaming me – highly likely run by Tsem people) into the “Most Clicked” list. The WordPress team said I can’t block IPs from Malaysia to stop this. Stupid as this is, these attempts might at the end rather promote the blog because higher view rates make the blog more relevant I guess. So long as Tsem can get his male students to put on women’e clothing, we will be plagued by the cult. I have no problem at all with men wearing women’s clothing. I skipped through the video and wonder what it wants to tell. From an artistic perspective I found it rather very embarrassing. Whether or not one condones cross-dressing for lay people, it is absolutely without doubt that male monastics wearing makeup in public–like for instance lipstick–violates Vinaya rules for monks, right Tsem? Same goes for selling buddha rupas online, right Tsem? Same goes for disparaging Sangha members of which community Tsem certainly is not. they declared themselves fools, what to do? Ok. I delete all three including this comment. I wondered already for what that should be good.